Looking for a simple outdoor advertising fixture that will withstand inclement weather? 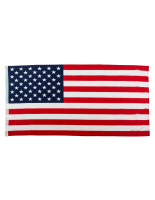 These 3 x 5 message flags are made of long-lasting nylon and can include an aluminum flagpole. Featuring pre-printed message lettering that says "OPEN," "SALE," "NOW RENTING" and more, these fixtures will inform customers while fluttering in the wind. 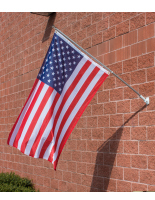 Each 3 x 5 message flag, or stock text banner, features bright red, white and blue stripes with bold black lettering that is easy to read from a distance. They are double-hemmed for extra durability, have (2) grommets and feature screen printing that shows a reverse image on the backside. These 3 x 5 message flags will resist fraying because each one is quadruple stitched at the ends to further increase strength. Where can these stock text banners be used? 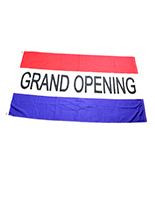 3 x 5 message flags with the "OPEN" messaging are great for any storefront because they will inform customers that a business is in operation. Stores may also use the "WELCOME" display as an alternative. 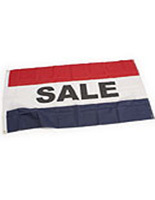 Models with the "SALE" messaging are ideal for retail outlets that are reducing prices. These are excellent for bringing in customers that are interested in getting a deal. Newly-opened stores will find displays with "GRAND OPENING" in pre-printed lettering ideal for letting passersby know that a new business has started. 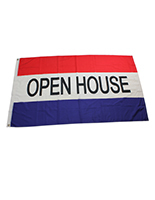 Real estate agents can use these message flags to attract onlookers to a property. When mounted to a building or fence, these fixtures will inform potential buyers that a house or office space is available. Some models feature "OPEN HOUSE" stock text that is more specific and geared toward real estate agents and renters. 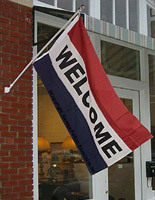 Message flags like these are great for outdoor events like flea and farmers' markets, street fairs and even yard sales. Event administrators can mark certain areas for parking with "WELCOME" banners or they can use them to bring in passersby from a heavily trafficked road or sidewalk. Merchandisers can also use these fixtures themselves to bring in customers from the marketplace. 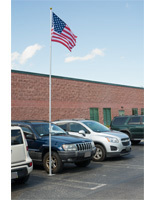 With some pre-printed flags, a 5' flagpole is included with the purchase. 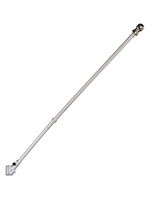 These poles are made of durable aluminum and with a white finish that goes with any environment. They also have a silver swivel top finial for extra decoration. Each holder includes (4) screws for attaching to walls or even horizontal surfaces. Also included are (2) mounting clips, (1) stationary and (1) alterable for accommodating displays with grommets. 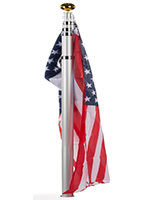 This type of flagpole also comes with a .25" diameter washer that keeps fixtures secured. Each pole has a wall bracket that can adjust to show banners at a 0° or 90° angle. 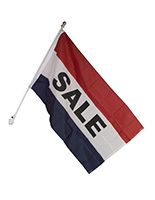 These pre-printed flags are ideal for any business, property, event or other location with their affordable price. Stock Advertising pennants like these are a great option because they convey a simple message with an attractive design. Even in light winds, they will flutter and attract attention from both sidewalk and street traffic. Order one of these outdoor merchandisers today and get same day shipping at SignSupplies2go.com!